Dream Cottages have over 120 hand-picked cottages welcoming pets. Our cottages are perfectly placed for exploring Dorset, with many of our properties located within minutes of coastal and country walks, pet friendly beaches and village pubs with beer gardens. Our wonderful selection of properties are peppered around the Dorset countryside, spanning in to Devon and Cornwall. Our cottages range from luxury modern bolt holes and pretty little chocolate box cottages, with wood burning stoves or big roaring fires. From beach apartments to old converted barns, from beautiful stone cottages with thatched roofs and little picket fences, to grand lodges with pools, we have a Dream Cottage for all! 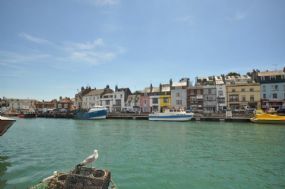 We can help you find the perfect location to suit your holiday needs, whether you prefer to be nestled in the rolling Dorset countryside, settled next to a pretty harbour or somewhere to soak up panoramic sea views. Whether you are a couple, a family or a big group of friends, with properties of varying sizes, you can cherry pick from our selection of beautiful abodes. Facilities - The majority of our properties provide linen as standard, please check when booking. Facilities differ depending on individual properties. Payments Accepted: visa, mastercard, Debit card, other.